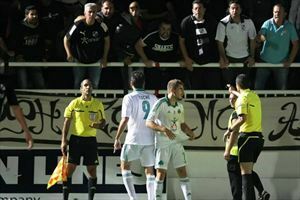 Eventually arrested this afternoon in Heraklion, Agios Myron fan who allegedly struck the black race during OFI - Panathinaikos held at the stadium Thodoros Vardinoyannis. The 40-year old fan was arrested by the local police A.T after automatic prosecution prosecutor. Formed at the expense of file for violation of the Act on Counteracting violence in stadiums. The believer will be tried with a new sports law and the provisions of which provide even imprisonment if this judge judges. Reminded that Monday afternoon, during the match, the 40-year old fan slammed his hand on the head of PAO player when he approached the grandstand of fans. From the police investigation conducted by the Police Services Division Heraklion, identified as a perpetrator of the said Act, the 40-year old Austrians, who was arrested. On questioning the acting First Precinct Heraklion. The arrested will drive tomorrow to Mr. Prosecutor Heraklion.